In 2009, Art & Design faculty member Dr. Crystal Hui-Shu Yang received a University grant to visit Wang in Inner Mongolia. Yang then invited the paper-cutting artist to UND through the Department of Art & Design’s Visiting Art Program. 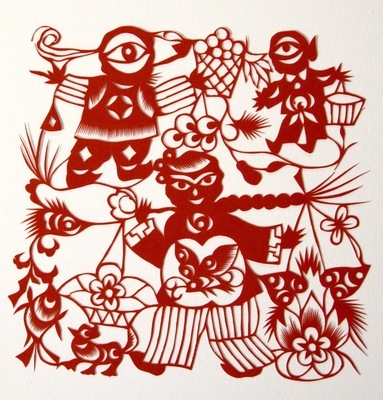 Wang’s asymmetrical paper cut, based on one of the twelve Chinese folk songs of her series, was made specifically for the artist’s UND solo show that coincided with the Chinese New Year in 2010.